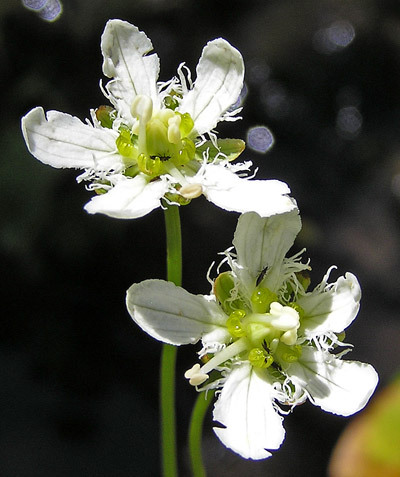 Both species of Parnassia shown below are quite delicate and slender with bright white flowers. Both plants are fond of streamsides and other wet habitats. 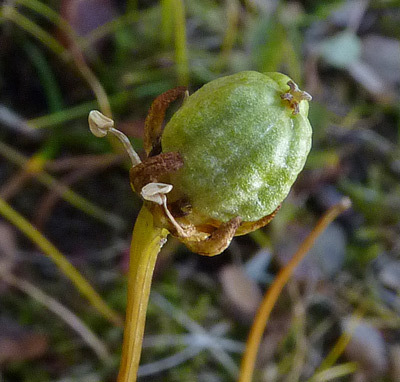 According to the Angiosperm Phylogeny Group (APG) taxonomy, which I follow on this web site, Parnassia is in Celastraceae, the Staff-tree Family, but all floras of the Four Corners states place Parnassia in Parnassiaceae, the Grass-of-Parnassus Family. I have decided that it is best to stay with the local floras. Subalpine, alpine. Streamsides, wetlands. Summer. Lake Hope Trail, August 6, 2010. 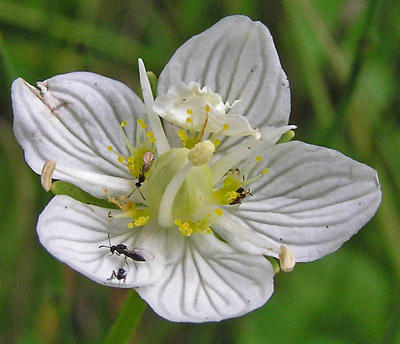 Grass of Parnassus is not rare but it is uncommon enough to be a pleasant surprise when found. Tall, delicate, almost leafless stalks are surmounted by brilliant white five-petaled flowers. Five white stamens alternate with five sterile yellow stamens. The lower sides of each petal are delicately fringed. 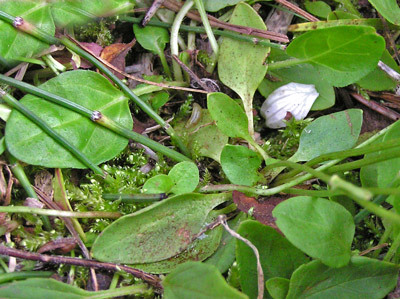 The small, basal, heart-shaped leaves often are folded almost cup-like. 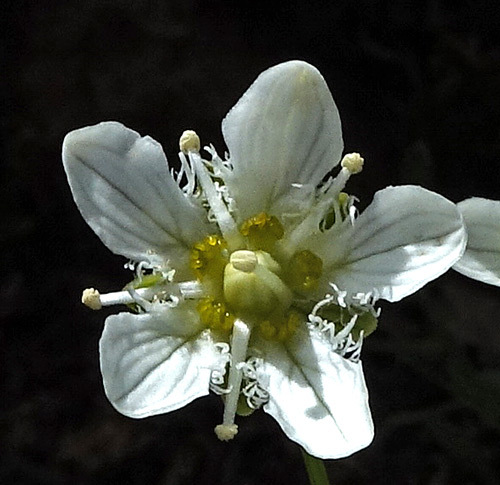 Grass of Parnassus likes subalpine and alpine stream-sides and damp areas. Linnaeus named this genus in 1753, and Karl D. Koenig named this species in 1804 from a specimen collected by Archibald Menzies in the present day state of Washington in the late 1780s. 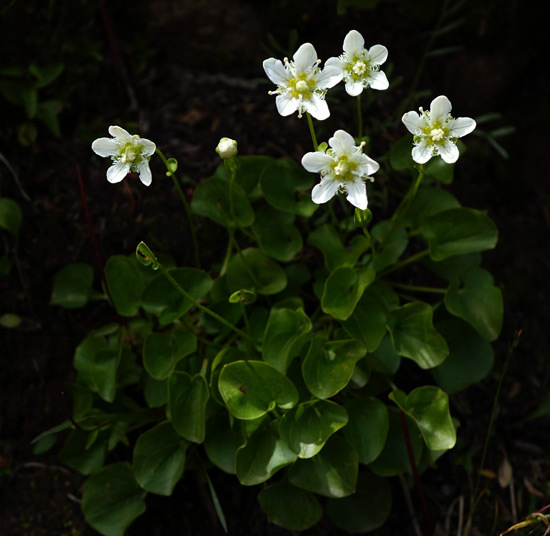 "Parnassus" is a famed mountain in Greece sacred to Apollo and the muses, and, according to Intermountain Flora, Dioscorides described a member of this genus he found on the slopes of Mount Parnassus. 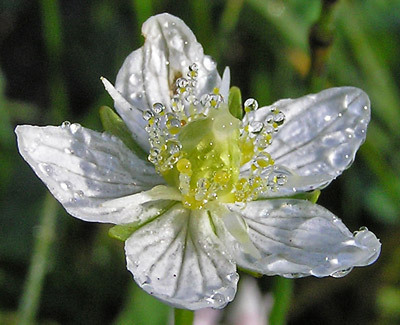 He gave it a Greek name which translates as "Grass of Parnassus". "Fimbriata" means "fringed". Lake Hope Trail, August 6, 2010 and August 11, 2014. West Fork of the Cimarron Trail, Uncompahgre Wilderness, August 22, 2004 and July 21, 2009. 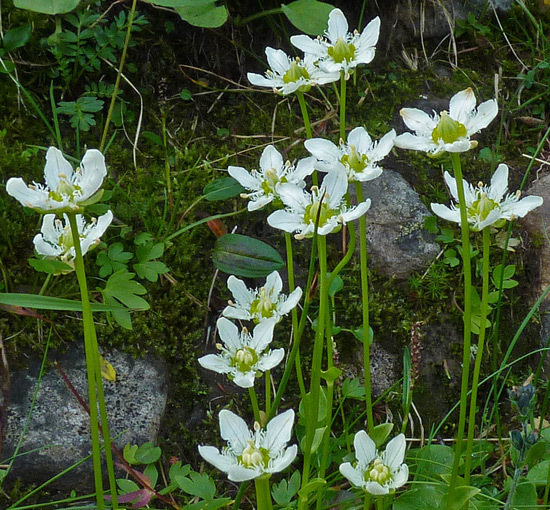 In the top photograph at left, Grass of Parnassus shines white over the sparkles of a small stream. In the bottom you can see both the fertile (long and white) and infertile (short and green) stamens. Lake Hope Trail, September 20, 2011. 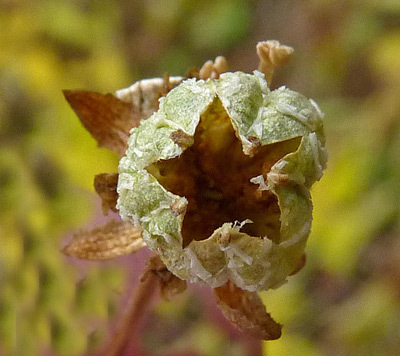 Seed pods have a symmetry and beauty of their own. 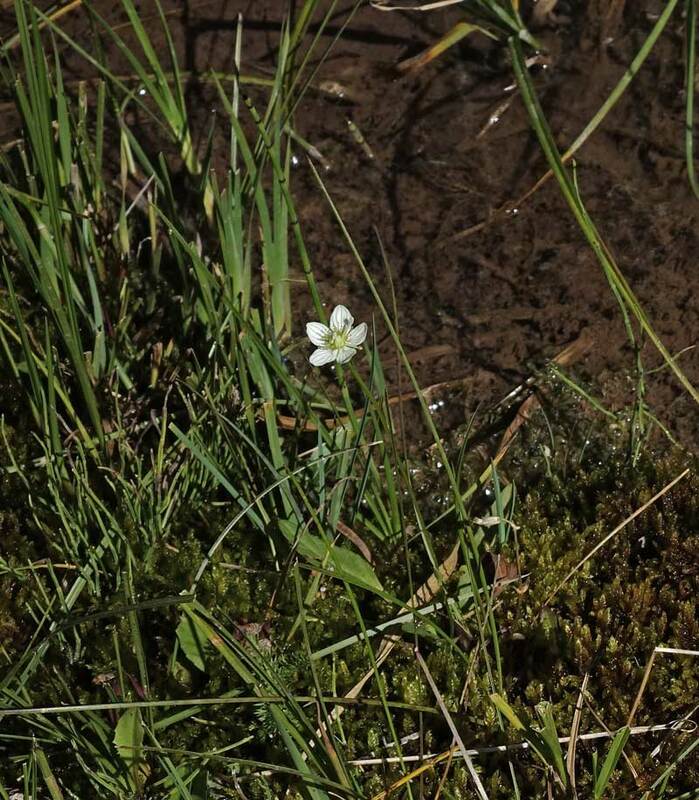 From the height of a person, Parnassia parviflora shows only as minute white dots in its typical wetland habitat. When we bend down close to the height of the plant, we get a better view of the flower, but the stem and leaves are still shrouded in the mystery of other green. Above and left: Wildcat Canyon Trail, August 17, 2017 and August 15, 2007. 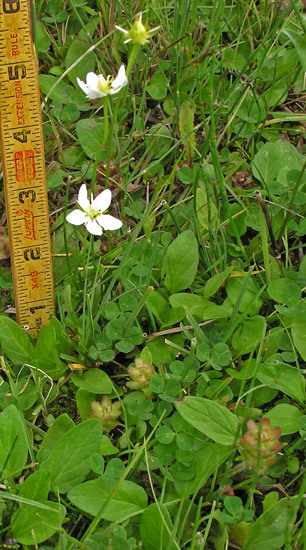 The Parnassia shown at left and below is far less common in the Four Corners area mountains than Parnassia fimbriata and, in fact, the plants pictured are the first recorded in Montezuma County, Colorado. The correct name of this plant is debated. Is this P. parviflora or P. palustris? 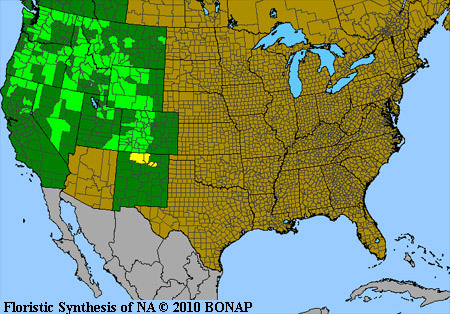 Weber and Kartesz indicate that it is P. parviflora and that our area and all of Colorado have only P. parviflora, but the Flora of North America indicates that both P. parviflora and P. palustris are present in Colorado. The species shown to the left and below keys to Parnassia palustris with the FNA. 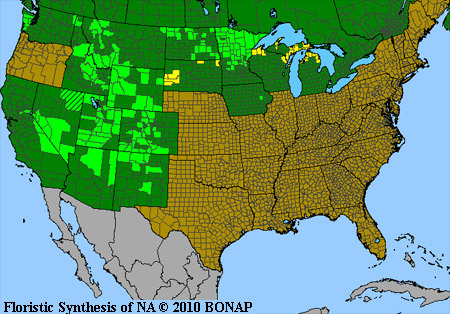 It also keys to P. palustris using the Flora of the Four Corners Region and Flora of Colorado, but these two floras show only P. palustris in the area and both floras indicate that P. parviflora is a synonym for P. palustris, i.e., there is only one species everywhere. Whatever its name, this species grows from three-to-fourteen inches tall with a cluster of very small (1/4" to 1 1/2" long) cupped basal leaves which are often buried, as in the photograph at left, in a mass of other greenery since P. parviflora typically grows in lush wetlands. Stems have one miniature clasping leaf below the middle of the stem. Flowers are solitary and petals are no more than 1/2" long. 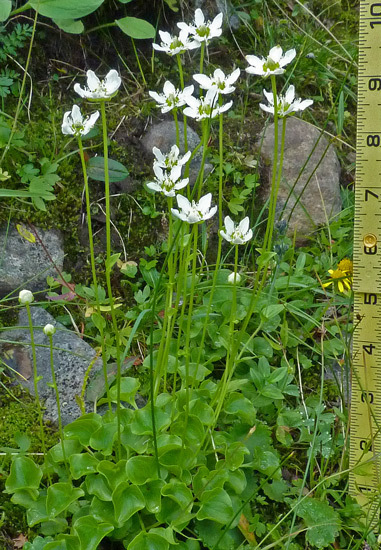 Weber indicates that the plant grows only in subalpine wetlands, but other botanists indicate that it grows at montane elevations as well as subalpine. The photographs on this page were taken at 8,200 feet. 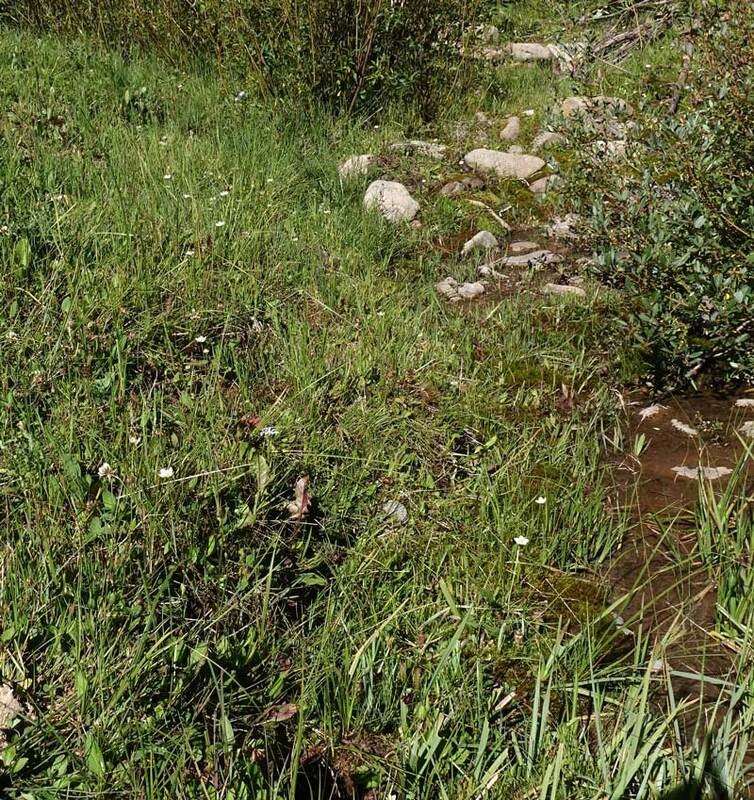 All of the plants shown are growing in moist soils and mosses at the edge of a small creek and along tiny rivulets feeding into the small creek. This plant is widely distributed around the world. 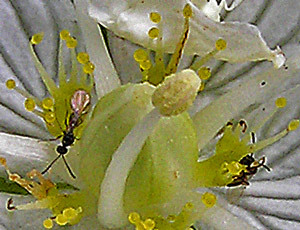 Linnaeus named this species Parnassia palustris in 1753 from a specimen collected in Europe. 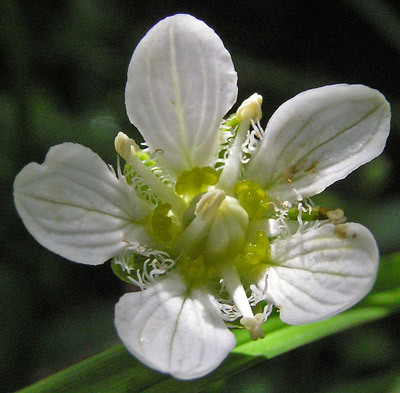 De Candolle renamed it Parnassia parviflora in 1824. "Parviflora" means "small flowered". "Palustris" means "marsh". Wildcat Canyon Trail, August 17, 2017 and August 15, 2007. 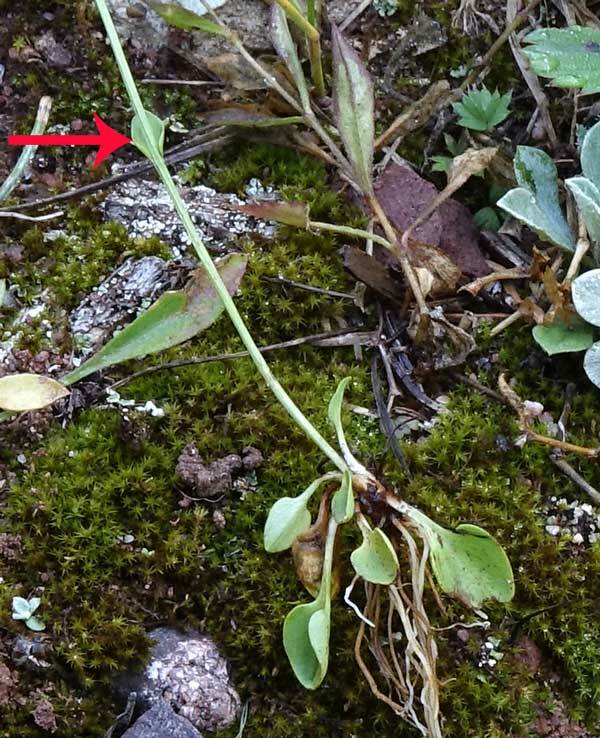 The red arrow points to the lone, minute stem leaf. Basal leaves are cupped or flattened. Roots are long and fibrous. Wildcat Canyon Trail, August 15 and 28, 2007. Brilliant white flowers attract your attention and then a close examination with a hand lens enthralls you. Pictured below are several stamens and several staminodes (sterile stamens) in between them. Staminodes are the yellow finger-like projections with glistening yellow spheres at their tips. In the photograph at lower left, the staminodes are encased in rain droplets.